A great gift for the holidays can be a pre-made baking mix or quick-scratch mix, like “Whole Grain Chocolate Chip Cookies,” measured right in your home. If you are like me, it’s fun to have an activity for your kids and knock off a holiday “to-do” item in one shot. The final mix and recipe are great for families to have on hand when they need to supplement a school party or want to have an after school treat in their house for the week. I regularly profess the cognitive and healthful benefits of cooking in my blog series “Learning Through Cooking.” However, it’s the holidays… let’s have a treat. Nothing like ringing in the snap of cold and holiday shopping season with a little bit of sugar, butter, and a warm oven. Plus, this recipe has two kinds of whole grains- whole wheat flour and rolled oats, so they’re a little bit more wholesome. And, in this article, I will share with you how to treat your friends to the gift of quick-scratch baking. What is quick-scratch baking you ask? 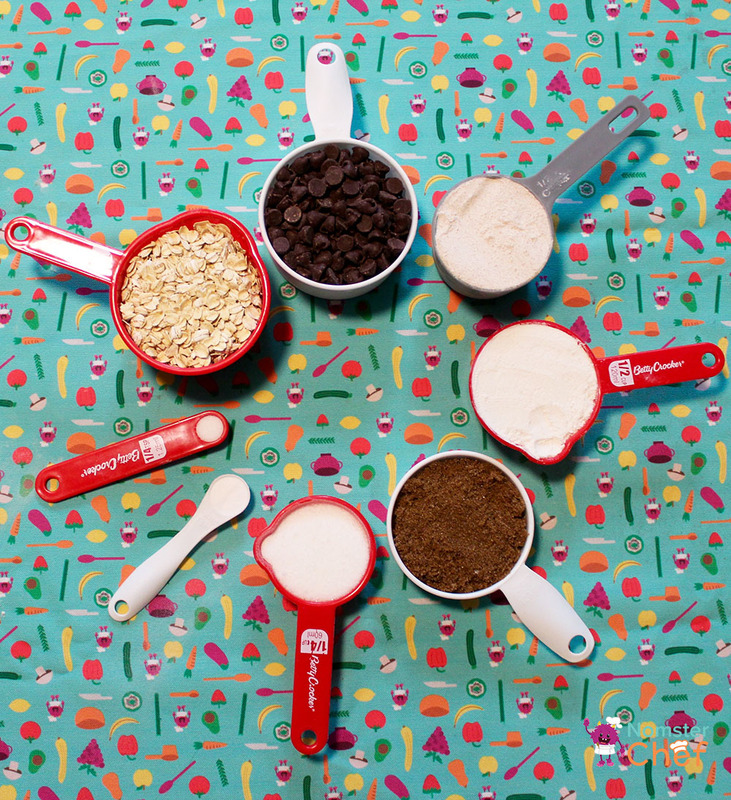 You may have heard it from a company we like, Foodstirs, that sells organic baking mixes and culinary family projects. Well, it arrives from the term “baking from scratch” or “buying basic ingredients. It means using more fruits and vegetables, and less pre-made items loaded with sugar and salt,” (you can read more about that here). Therefore, in quick-scratch baking you are doing the shopping/measuring for your recipient and they are adding the perishable wet ingredients…. and their oven. Can’t wrap and deliver the oven, right? Note for filling the jar: Be aware that your measuring cups will be wider than your jars and this may happen. 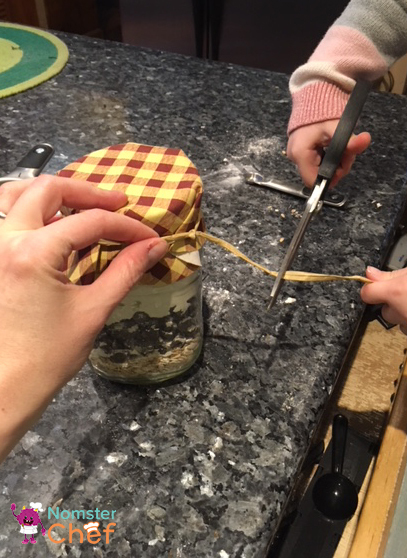 So either use a funnel or grown-ups can cup hand around the jar for protection! Measure 1 Cup Rolled Oats and pour into jar. Pack down slightly. Measure 1 Cup Chocolate Chips (or dark chocolate chips). Pack down slightly. Measure ½ Cup All-Purpose Flour. Pack down slightly. Measure ½ Cup Whole Wheat Flour. Pack down slightly. Measure ½ Cup Dark Brown Sugar. Pack down slightly. Measure ¼ Cup Granulated Sugar (or evaporated cane juice sugar/raw sugar). Pack down slightly. Measure ½ Teaspoon Baking Soda. Pack down slightly. Measure 2 Pinches of Kosher Salt. Pack down slightly. Repeat and make more jars for all the people on your nice list this year! Emma and I had fun making this for for a family friend and hope they enjoy the quick-scratch kit as much as we enjoyed putting it together to share with our digital baking friends - YOU! This cookie jar gift DIY is a wonderful way to say “Happy Holidays” to those you care about as well as give them an activity to promote kitchen time with young chefs. Preheat oven to 375 degrees F. Lightly grease baking sheets. Beat 1 stick butter in a bowl with a wooden spoon or an electric mixer until creamy. Add 1 egg and ½ teaspoon vanilla until blended. Add cookie mix to butter mixture; stir until well blended. Final mixture will be stiff. Shape Tablespoonfuls of dough into balls and place 2 inches apart on baking sheets. Bake 7-8 minutes or until completely firm. Rest cookies on sheets 2 minutes. Remove to wire rack to cool. Nom! Emma Krenn is a Junior Assistant to Consultant & Contributor Jamie Krenn at Nomster Chef. She is currently an elementary school student studying letters, karate, numbers, and French. She is a very funny girl who is unable to resist gluten-free brownies, nana's meatloaf, and hot dog trucks. 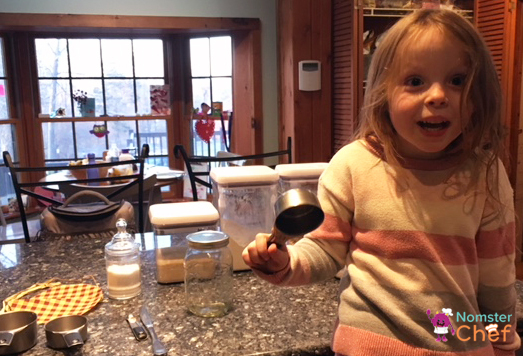 Emma loves to cook with her mommy and often makes up her own recipes. Her favorite things to cook are 3-Day Croissants, gluten-free chocolate chip cookies, "whatever we have in the fridge" salad, roast chicken and Saturday morning pancakes with her Daddy, Steve.